TRENTON, N.J. -- Gov. 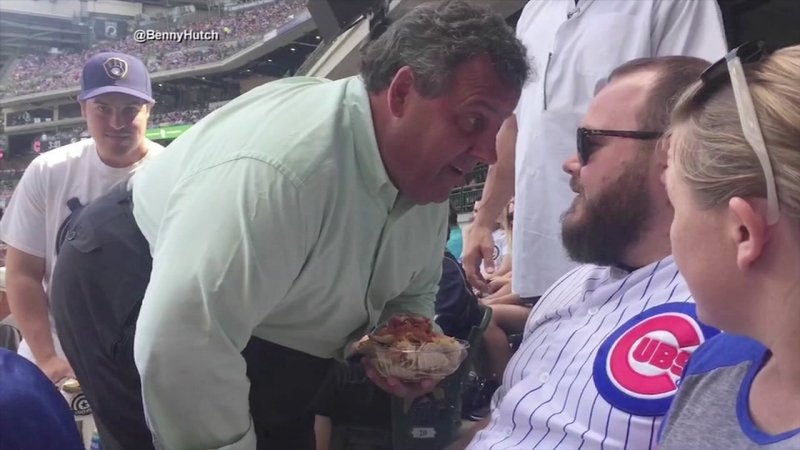 Chris Christie reminded people on Wednesday that he didn't dump nachos on a Chicago Cubs fan who heckled him. Speaking at an unrelated event in Trenton, the Republican governor said three days after he confronted a heckler at a Milwaukee Brewers-Cubs game that he won't quit attending baseball games. "I didn't dump the nachos on him or anything, which was an option," Christie said. "No, I'm not swearing off baseball games in any way." Christie confronts Cubs fan: Sarah Bloomquist reports during Action News at Noon on August 1, 2017. Christie was carrying nachos when he was caught on video calling the fan, Brad Joseph, a "big shot" during Sunday's game. Christie said Joseph heckled him once and he confronted Joseph after a second jibe. "I will take a certain amount of abuse," Christie said. "You're a public official, you have to. But usually it's one. You get one shot to call me a name or curse me out." A former high school classmate of Christie's who masterminded the 2013 George Washington Bridge lane-closing scheme in a political vendetta targeting a Christie foe says he wasn't so lucky. "Wish all he dumped on me were some nachos," tweeted David Wildstein, a former Port Authority of New York and New Jersey official who contradicted Christie's account that he didn't know about the bridge plot until months afterward and was sentenced last month to three years of probation. Christie, who wasn't charged in the traffic jams scheme at one of the world's busiest bridges, was loudly booed at a recent game between the St. Louis Cardinals and the New York Mets after snagging a foul ball. His next opportunity to be booed could come Friday, when he attends the NFL Hall of Fame induction ceremony for Dallas Cowboys owner Jerry Jones. Christie said Wednesday he and his wife would be Jones' guests at the induction Friday and Saturday. Christie is a longtime Cowboys fan, much to the annoyance of some New Jersey residents, who tend to back the rival New York Giants or Philadelphia Eagles.